If you're a 365 Global admin or Azure Active Directory Tenant admin, you can download a list of active users in your tenant, so you can see not only who's accessed PowerApps, Microsoft Flow, or both, but also the licenses assigned to those users. In this topics, you'll learn how to download a list of active users to a .csv file, and then view that list in Excel. To follow the steps, you need Office 365 Global Admin or Azure Active Directory Tenant Admin permissions. Sign in to the Admin center at https://admin.powerapps.com. In the navigation pane, click or tap User licenses, and then click or tap Download a list of active user licenses. The list of users is downloaded into a .csv file. This process could take several minutes. Make sure that you don't close the window before the list completely downloads or you may have to restart the process. After the .csv file is created, open it in Excel. The list contains each user’s name, email address, license type, and other information. A user who's accessed a product at least once is considered an active user. 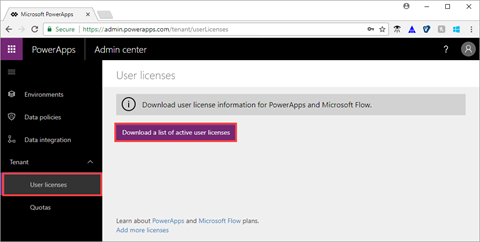 Since this is a list of active users, it does not contain users who have licenses for PowerApps and Microsoft Flow but have never accessed them. You can view all user licenses from the Microsoft 365 admin center. The following example shows two users who have licenses to both PowerApps and Microsoft Flow. Jane Doe has access through a subscription to Office 365, and John Doe has a trial license for each product. If a user has left the organization, the list will show Unknown in the User name and Email address columns. If the list shows Unknown but nobody has left the organization, wait several minutes, and then download the list again. To add user licenses, open the Microsoft 365 admin center. In this topic, you learned how to download and view a list of active users in your tenant. To learn how to download and view a list of apps created in your environments, continue to the next topic.